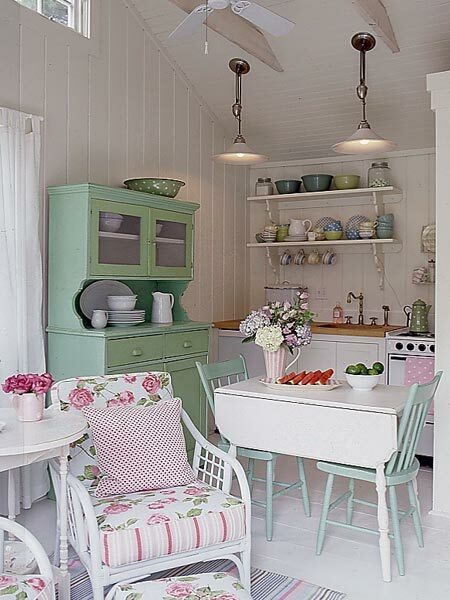 As much as I love modern, vibrant homes, I cannot help but adore cottage chic homes full of pretty pastels. 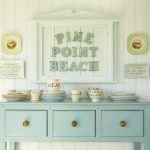 Designer, stylist and retail store owner Tracey Rapisardi is surely an inspiration when it comes to beach style and cottage living. 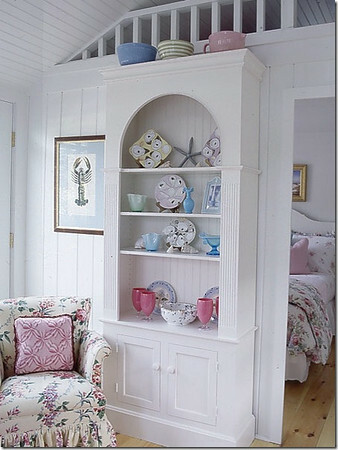 Check out this post I put together last October for even more beautiful rooms designed by Tracey. 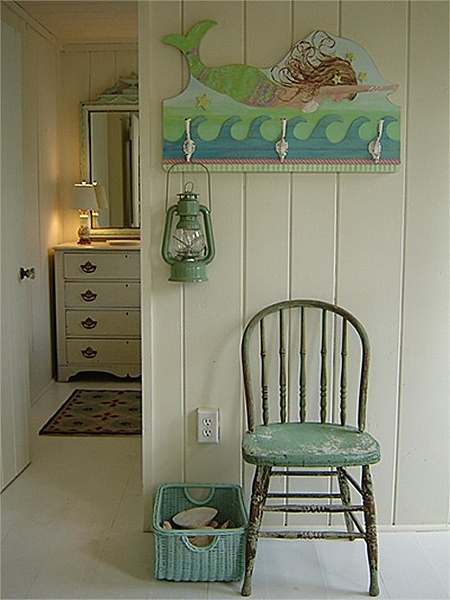 Images via Coastal Living. 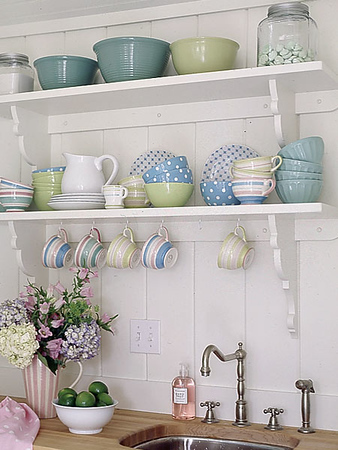 Love, love, love that kitchen. Be still my heart. It makes me want to cry. Love your blog by the way. I check it every day!!! Oh, how sweet this is! That little mermaid is so cute! I could just move right in! The chandelier in the first picture is awesome! Where have I seen those polka-dot bowls before (which store? )….hmmm…this is going to drive me crazy! 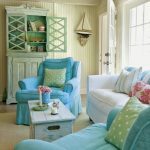 Love the dining room table – so relaxed and ‘beachy’ and fun! Musette, yeah I am too! I have no idea when or where or what happened with that! The bowls have been driving me nuts too!!! They sorta remind me of Paula Deen’s that were at Dillard’s, but those were rimmed in brown. I have no idea!! Hmmm. Could the bowls be from Anthropologie? I know the solid ones look like theirs. I agree with you, I love modern homes, but also this simple, aged aesthetic is just so cozy and pretty! These rooms are luscious! I think I would have to add a tiny bit of red and black though. Red just perks things up a little. The dining room up there is making my heart stop! 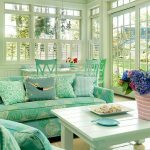 Your blog is the one I look forward to most (of course, I have a turquoise obsession too)… but even in general, you find the most amazing spaces to post! finally some confirmation i can mix my greens and blues! yea! 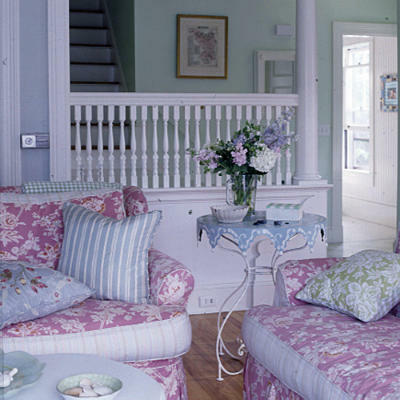 This home is so sweet it makes my heart ache. Bee-you–tee-ful!